Judy Murray passes on some tips as she attends a family day at the courts in Maryhill Park. Picture: SNS. 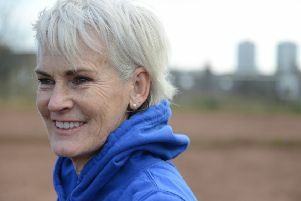 Judy Murray is confident that her tennis foundation can re-engage communities as she seeks to help overhaul derelict tennis courts in the Maryhill area of Glasgow. In Glasgow last year there was a requirement for more than 31,000 emergency food parcels to be distributed from foodbanks, stats that illuminate the depth of poverty levels in some of the poorest areas of the country. Murray became involved in trying to revitalise five overgrown courts in Maryhill Park when a local resident tweeted photographs of his efforts after he had weeded and rolled the courts on his own initiative. 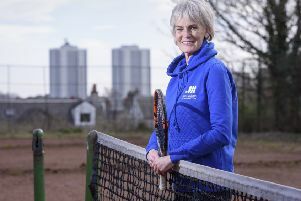 Murray is optimistic that, with some small investment, there could be considerable long-term rewards for the local community as she seeks to highlight the varied benefits for which sport can be a catalyst. “The boys [Andy and Jamie] have been so successful and created a huge profile around tennis but we need to do this now to make tennis accessible and affordable for everyone,” she said. “I have always hated the idea that tennis is only for people who have money. It really shouldn’t be, it doesn’t have to be and it is why it is so important that you get community courts such as these operational. “We need places like this. I was talking to Peek [Possibilities for Each and Every Child] and they said that they had planned a playdate here with 35 local families and I was delighted to take up their invitation. “If we resurface it and re-fence it and if we could get that, then my foundation can come in and work with the local community. There are three primary schools and a secondary school within walking distance of here so if you network the school and involve the local residents then you can have a great community facility. This is what it is all about. “You get so much out of it – inter-generational bonding within the family, activity, social skills and leadership and sport can change lives. We need to make it more accessible to more people. We have had huge success in the east end of Glasgow. Two-time Wimbledon champion Andy posted a clip of himself gently batting a ball off the wall this week on social media, his first sighting since undergoing a hip resurfacing operation in January, progress that was cautiously received. “He is fine,” said his mother. “He was just hitting the ball against a wall. It is only weeks since he had surgery but he is not in any pain.